Meticulous planning is needed to prepare for the surgical repair of splenic artery aneurysms due to their very complex anatomy. A study conducted at Stanford University Medical Center to evaluate the clinical utility of augmented virtual reality—the holographic visualization of images as if they were real physical objects—showed that these images were superior to images created by standard volume-rendering software. Courtesy of EchoPixel. Access the video here. For the study, pre-procedural computed tomographic angiography (CTA) images of 14 patients with 17 SAA who had undergone endovascular repair were reconstructed using a virtual reality visualization software system (True 3D, EchoPixel, Santa Clara, CA). Standard volume-rendering was also performed (AquariusNet, TeraRecon, Foster City, CA). The virtual reality system converts computed tomography (CT) scans into 3D images that a radiologist can virtually move and examine while wearing a pair of virtual reality glasses. Dr. Devcic explained that virtual reality enables a clinician to obtain a deeper and intuitive understanding of spatial relationships, such as between an aneurysm and the surrounding arteries. Three radiologists independently evaluated the number of inflow and outflow arteries using both reconstruction software programs. Seventeen inflow and 22 outflow arteries were associated with the SAA. 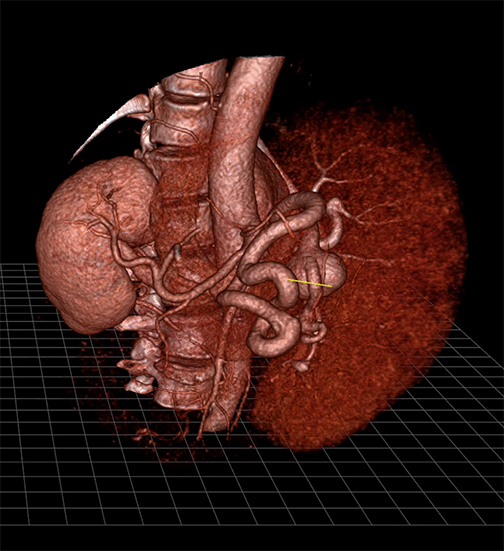 Clinical utility was measured by virtual reality visualization software’s ability to accurately identify all inflow and outflow arteries associated with the SAA, and subjectively by operator confidence. Procedural angiographic images served as the gold standard. Radiologists also ranked improvements in their confidence on a four-point scale when they used visual reality compared to standard-volume rendered images. While the overall sensitivity, accuracy, and positive predictive value (PPV) were similar for both reconstructions, the ability to view and manipulate images in true three dimensions using virtual reality markedly improved operator confidence. The first virtual reality 360 training video showing an interventional radiology procedure, a special project of the Journal of Vascular and Interventional Radiology (JVIR), made its debut during the Extreme IR session of SIR 2018. Session attendees received complimentary VR viewers to experience the video on their smartphones. Dr. Haskal with SIR 2018 3D viewer. Health System. Access the videos here. The video shows Ziv Haskal, MD, professor of radiology and medical imaging at the University of Virginia Health System in Charlottesville and editor-in-chief of JVIR, and his colleagues performing a transjugular intrahepatic portosystemic shunt (TIPS) procedure in which they created a new blood vessel within the liver of a patient using tiny catheters, balloons, and stents under image guidance. Viewers who wear virtual reality goggles can look around in 360 degrees. In the video, Dr. Haskal guides viewers step-by-step through the entire procedure. The strategic use of picture-in-picture lets the viewer see what Dr. Haskal is doing and what he is seeing. 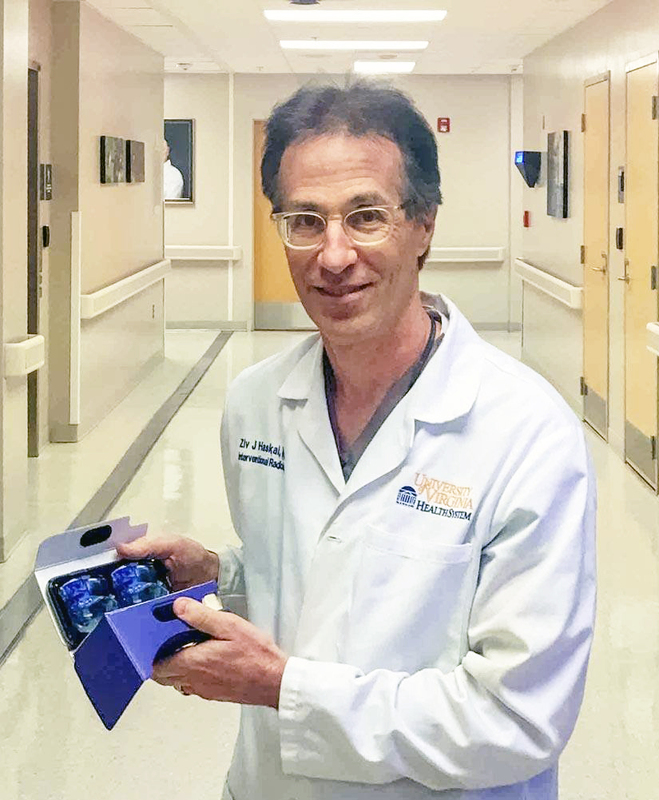 Whether watched with high-end virtual-reality goggles or inexpensive cardboard 3D glasses, Dr. Haskal’s virtual procedure puts the viewer right in the room with him as he creates a new blood vessel through a small nick in a patient’s neck. Dr. Haskal designed the virtual reality experience as a teaching tool for physicians and trainees, but he said he foresees many other applications. It could be used to show a patient what to expect during a procedure, to teach a nursing student what must be kept sterile in an operating room, or to provide a refresher course for interventional radiologists.“Virtual reality is a force multiplier, providing expert training to physicians around the world, those wishing to refresh their skills or gain confidence for delivering care in environments where clinician experts cannot provide them in-room training,” he said. Dr. Haskal told conference attendees that he is already planning next-generation virtual reality projects to serve as teaching tools for healthcare professionals, as well as for patients to learn more about interventional radiology procedures. Access the videos mentioned in this article here. Virtual reality at SIR 2018. Appl Radiol.